And also a partner of tomorrow. I was twelve when I wrote this. Name of the poem was ‘Memories’. I happened to stumble upon one of my personal diaries from school. A series of laughs and tears flooded my head. The diary had been with me through the times when I had lost my mother. And hence the transition in my writing, expressions is almost synchronous with the events. But what completely surprised me was that given this is now close to eighteen years to the present date, I haven’t really changed much. I am still laughing re-reading this. Cause this is so me! I still do this. I will make random schedule notes in the middle of the day. And plan my weekend the most. Maybe because I know inside that a wasted holiday will pull me down the entire week. Yeah, nerd. That’s just me! But seriously again notice how I am even today doing similar things. Still making notes on being polite to people (and failing miserably!). Still forcing myself to go out and have fun and not be guilty about it. Even today I am a wiki addict on holidays. And reading up extensively on a personality or a country is so me! Is this true then? Have we only re-discovered ourselves over the last few years to be nothing but extensions of our childhood? Is behavior like DNA perhaps not changeable after all? I ask you tonight if you were to pin point a character in you which can be traced back to your childhood, what would it be? Loved your post very much. Old memories are always sweet. ha! look at you! Somethings do not change. When I was in school I was very organised with a to do list. Now I live life spontaneously. It’s a whole lot easier and definitely more enjoyable. I guess my quality of listening in to random conversations when around people is still a part of me. Your diary notes made me smile. Reminded me of my own diaries. Oh yes, our childhood experiences and behaviour shapes us as an adult. That is why they say that the foundation during child development has to be right! True Shilpa so much depends on it right? This little Richa is ditto the current Richa….absolutely! I totally agree when you say we are but extensions of our childish selves! My mom often bemoans the fact that I haven’t outgrown some of my not so likable traits since childhood! Beautiful post my dear! I pressed my head hard to remember what was that one thing from my childhood that has remained with me till date and I could not recall anything. A question for me – ‘Have I turned into a fossil?’ A fossil, may be not yet. 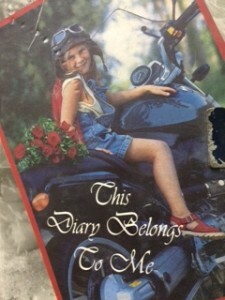 I used to write diary entries as a 14-15 year old daily before sleeping and would guard it dearly from everyone else. My younger brother was always after it trying to excavate it from different dumps. One day I caught him reading it. I got so pissed off that I glued every page of it and vouched never to write a diary ever again. 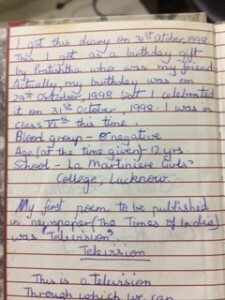 And, today I am doing the same thing, I am writing my diary on my blog but devoid of the teenage issues. Extension of childhood. I m glad you are still an extension of your childhood. I have changed , in many things. I have complaints. I was contented. I knew what I wanted , had clearly planned it. Now I dont know what I want. But your post let me ponder over my childhood again. Wonderful post! Or Ramya perhaps there were less wants and hence clarity. No? As discussed, you and I are two souls swimming in a pond la! It’s always lovely to go back to the past and rekindle those memories of the days gone by :). By the way interesting to note that you were in La Martinere :D.
Haha now why the lamartiniere and 😀 ? ?